GoodMarket is a (fictitious) medium scale grocery franchise based in the United States. Although their customer satisfaction ratings have remained relatively constant over the last 4 years, their market shares have been decreasing by 8% each year. If they continue at this rate for another year or two, they’ll be forced to shut their doors. Through market and user research GoodMarket have determined that this decline is most likely due to the increase in online grocery ordering & delivery products. They believes that if they allow their customers to shop and buy their products online they can expand their customer base and market share. After market & user research, Good Market has determined that busy young professionals make up a large portion of their product’s target market. They’ve created a persona called ‘the busy professional (TBP)’ to describe the qualities of the type of user they are focusing on. ● What is the expected business goals for the product? ● What are the user's goals? 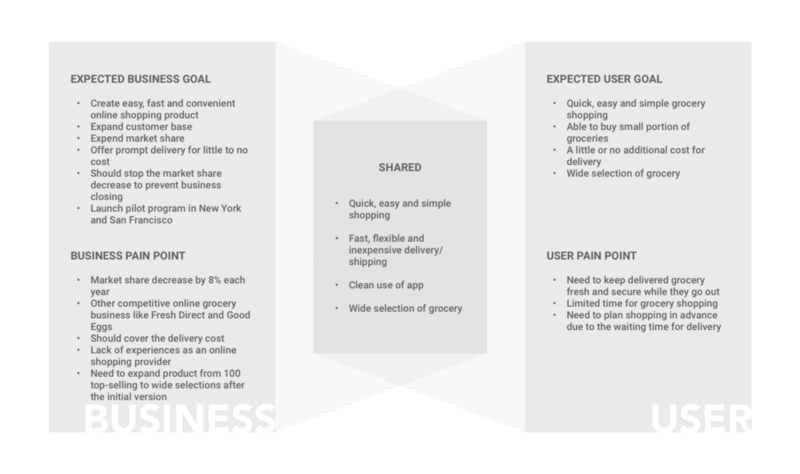 ● How do the business and user goals align? Before start designing, I identified 3 products that are similar to or in competition with the online grocery product I’ll be designing. This analysis helped me to learn what solutions exist, what works well and what can be improved. I used this information to help me design a product later on. For each of the three competitors, with a screenshot of their landing page or application home screen, described the service and my initial impressions of the product. Based on the scenario below and 'The Busy Professional' Persona, I answered a set of questions to describe why the user comes to the product, and what tasks they will complete to accomplish their goals. As an extension of user research and to create smooth and intuitive shopping experience, I performed a card sorting exercise. I identified 3 participants that are in the target market of the busy professional and asked them to participate in a card sort. They grouped the item cards into categories and name those categories. This helped me to make a more informed decision about how the information would be organized. I created sitemap based on the previous researches to show the relationship between the contents. This product supposed to be launched as a mobile app first, so I used some of existing mobile shopping app as references like Gilt, Peapod, Sephora, etc. I wanted to identify the paths that a user would take through the product to complete each task. I tried to empathize with TBP based on the previous researches and competitive analysis. The entire process of how TBP will experience the product from arriving to homepage to checking out was grouped into 3 phases. I described the user experience throughout as precise as possible. I started with the hand sketch, and then followed UI design guidelines—especially the grid system which I learned from UI design course. I focused on the most key features to make it look clear and functional. 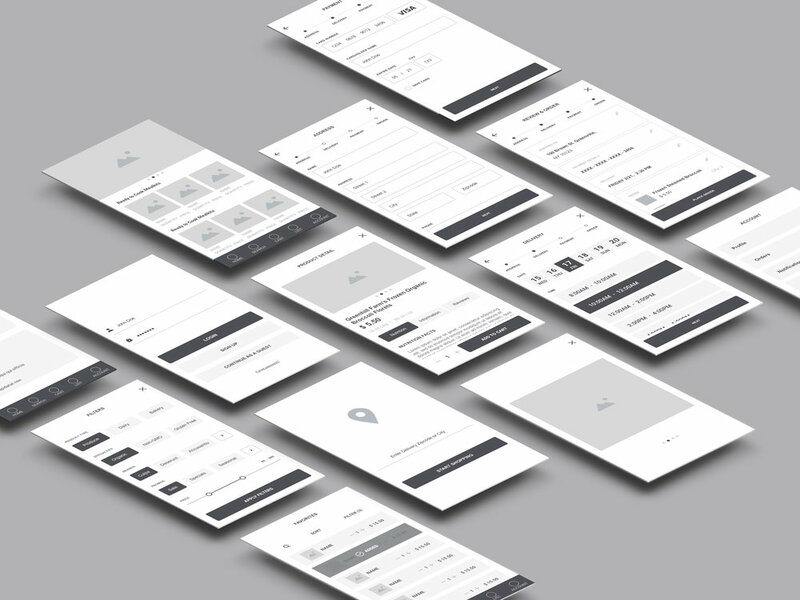 Gathering all materials together, I delivered an interactive prototype to test which was created with Sketch, Photoshop and Principle.